I've been trying to slow things down a little bit this year in an effort to make the most of the Christmas season and the priceless time I have with my little guys while they are young. It's really been great (if not a little bit hard) to let go of some things and just let the season sink in. As always I have a kagillion ideas for Christmas starting Dec. 1st and just want to run with them, i.e. - handmade ornaments, super fantastic handmade gifts for the boys, friends all my extended family, a gorgeously decorated home, delicious treats and goodies for all, you know, the list goes on (and on top of that, it's also a really busy time of year for illustration and my etsy shop...). While doing this stuff can definitely get me into the Christmas spirit, it can also stress me out if not kept in check. This year I really want to be sure to reflect, serve and really feel the Peace of the season. So we are keeping it simple. 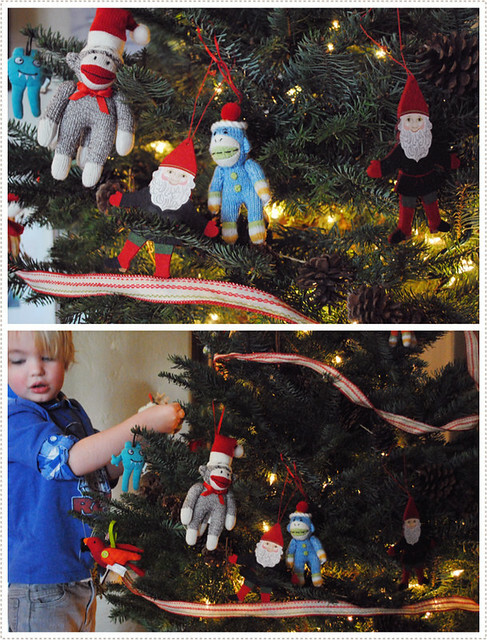 I started this by letting go of the idea of creating a new, perfectly decorated tree and just let the kids go for it. It turned out to be a magical afternoon full of joy and merriment. Little A was ready to put the tree up just as soon as we got back from our Thanksgiving travels so we headed over to our local lot. The Christmas spirit must have been in the air because the kind salesman offered to let us name our price (he must have noticed our gawking stares when he told us just how much this little squatty tree originally went for). He then proceeded to pull out some santa hats for the boys so that our picture taking could be more festive. We were very thankful for his kind spirit which really set the mood for the rest of the day. (Which helps when I think of how my iphone was set down and then most likely swiped at IKEA yesterday...yeah I know, sad story). 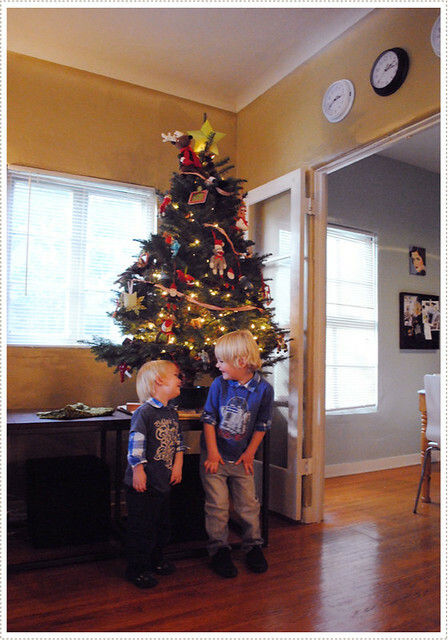 The boys were very happy with their work and the Christmas spirit began to resonate throughout our home. Can I just say I love this time of year! Little O is walking around singing Jingle Bells and Little A is trying to figure out how Santa is supposed to get to our house if we don't have a chimney (he doesn't like the idea of him using the door...just doesn't seem right I guess). And don't worry, I still have a few creative ideas I want to share, and you can hop on over to Giverslog to see what I'd slip into santa's sleigh for all of you if I could. Hope your season is feeling merry and bright! What a fabulous day spent with the people you love. It sounds beautiful. Merry Christmas. Hey! I stumbled on your blog through craftgrrl and think it's great! Did you make those little sock monkeys? I'm thinking those would be great gifts for friends. If you did, could you point me to the pattern you used? Thanks, and hope you have a great holiday! i keep checking back here anxious for your creative juices to instruct me! very cute tree-- it looks like the size of ours, which is sitting on the floor, and so far the baby has yet to do too much damage, but the presents aren't out yet! just yesterday i bought some little russian dolls that i plan to use on next year's tree (this year's is already done! 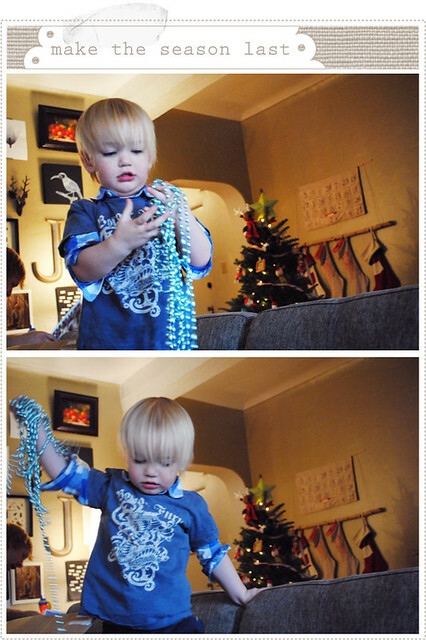 ), and i thought of using just the ribbon that you did with your monkeys. great minds! i hear you about just trying to take it easy a little bit and do as much as you can. but i love what you said in your interview (wasn't it you?) about keeping a holiday journal, so that you can tuck away your good ideas (and this year's bad ideas!) so as not to be forgotten next year! i'm still gearing up to make the stockings, we actually have a real fireplace in our apartment, and what a crime to not have stockings! (i couldn't buy them here if i wanted to). my girls are also worried about santa, but not about him coming through the door (though i'm sure that would worry them too) but about his getting dirty in the chimney. i had so much to say! i miss you! oh, and i knew that wasn't all. i found my balloons on amazon for 1/3 the price! if only someone could bring it to me from america! i still want it desperately! We don't have a chimney either. But we've told the girls that Santa comes through the attic. Somehow that is sticking. I think the tree looks great when you let the kids go wild! Although I guess the adults kind of have to do the top bit or all of the decorations end up on the bottom! Thanks for reminding me to step back and breathe, and take in these precious moments!